Winter is a harsh time for vehicles and a busy season for garages. Temperature extremes and high levels of moisture, road dirt and salt, can all cause accelerated wear of critical components – especially the braking system. 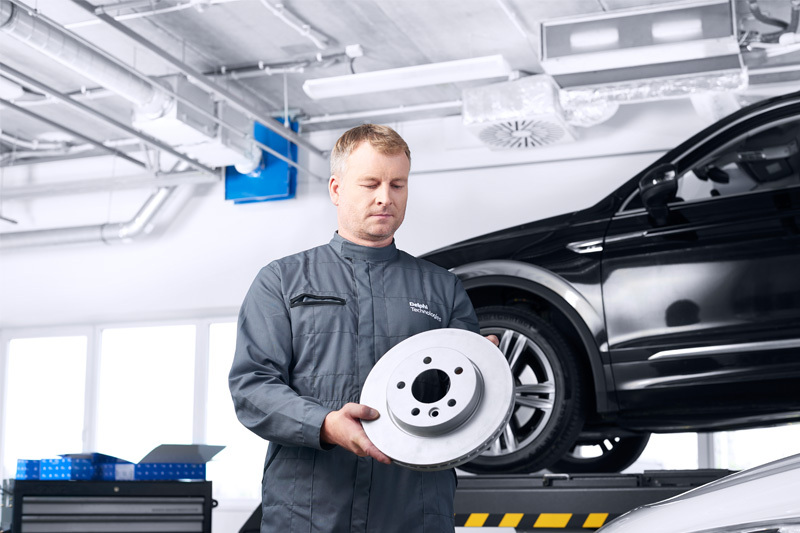 Regular brake checks and replacement of worn components are vital, but are there further steps that technicians can take to add value and safety for customers? Delphi’s Julian Goulding provides the answers. Safety is of paramount importance and the quality of brake component replacement should not be compromised. The use of OE-quality products as part of a fully- functioning brake system is the first step, but there are technologies available to the aftermarket that further enhance safety levels, especially in demanding winter conditions. One such technology is Delphi’s coated brake discs. Featuring a special zinc- flake, anti-corrosive coating, it offers maximum protection against corrosion, which can be particularly aggressive during winter months. Delphi’s coated discs are manufactured to the same quality as all the company’s parts, but the even application of an environmentally-friendly, water and zinc- flake based Geomet coating adds a significant advantage, especially during winter weather. The coating has a salt spray resistance of up to 240 hours, compared to less than 100 hours for many partially painted discs, which provides considerable durability, and therefore safety benefits. Delphi ensures that all parts of the disc surface area are covered, including the top hat, outer rim, internal veins and friction surface. Oil-dipped or partially-coated components cannot offer the same level of resilience. Road dirt, especially salt and grit used in reduced temperatures, can penetrate unprotected crevices and lead to accelerated wear of components and a gradual reduction in braking performance. simpler. Finally, they are also far more aesthetically pleasing than alternatives. Discs aside, from a braking perspective what else should garages be looking at this winter? It’s important not to overlook the accessories required with each individual job. New accessories should always be used. Even if a component appears in good condition, it will have reduced tension and function. Each system is only as good as its weakest – which is normally the most worn – component. Such is the impact of winter weather conditions that the extreme strain, moisture and temperature changes placed upon components can quickly lead to unequal braking forces and a possible reduction in stability and safety levels. Not replacing accessories can also lead to accelerated pad wear, distortion and increased noise – all of which can lead to the one thing that every garage wishes to avoid: customer returns. A happy customer is a loyal customer, and a vital stepping stone for growing any business. For further information about the range of braking products available from Delphi, click here.